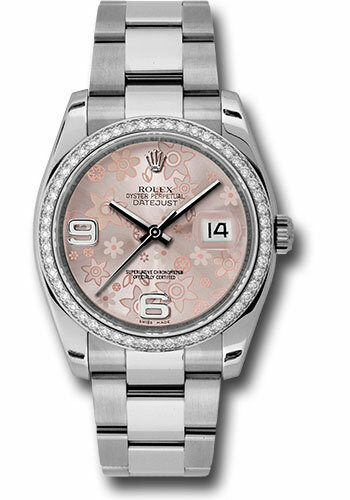 36mm stainless steel case, 18K white gold bezel set with 52 brilliant-cut diamonds, pink floral dial, Arabic numerals, and stainless steel Oyster bracelet. 36mm stainless steel case, 18K white gold bezel set with 52 brilliant-cut diamonds, pink wave dial, diamond set 6 and 9 Arabic numerals, and stainless steel Oyster bracelet. 36mm stainless steel case, 18K white gold bezel set with 52 brilliant-cut diamonds, silver floral dial, Arabic numerals, and stainless steel Oyster bracelet. 36mm stainless steel case, 18K white gold bezel set with 52 brilliant-cut diamonds, silver wave dial, diamond set 6 and 9 Arabic numerals, and stainless steel Oyster bracelet. 36mm stainless steel case, 18K white gold bezel set with 52 brilliant-cut diamonds, black dial, diamond hour markers, and stainless steel Oyster bracelet. 36mm stainless steel case, 18K white gold bezel set with 52 brilliant-cut diamonds, black dial, index hour markers, and stainless steel Oyster bracelet. 36mm stainless steel case, 18K white gold bezel set with 52 brilliant-cut diamonds, black Jubilee dial, diamond hour markers, and stainless steel Oyster bracelet. 36mm stainless steel case, 18K white gold bezel set with 52 brilliant-cut diamonds, black dial, Roman numerals, and stainless steel Oyster bracelet. 36mm stainless steel case, 18K white gold bezel set with 52 brilliant-cut diamonds, black sunbeam dial, Roman numerals, and stainless steel Oyster bracelet. 36mm stainless steel case, 18K white gold bezel set with 52 brilliant-cut diamonds, blue dial, diamond hour markers, and stainless steel Oyster bracelet. 36mm stainless steel case, 18K white gold bezel set with 52 brilliant-cut diamonds, blue dial, index hour markers, and stainless steel Oyster bracelet. 36mm stainless steel case, 18K white gold bezel set with 52 brilliant-cut diamonds, blue Jubilee dial, diamond hour markers, and stainless steel Oyster bracelet. 36mm stainless steel case, 18K white gold bezel set with 52 brilliant-cut diamonds, blue dial, Roman numerals, and stainless steel Oyster bracelet. 36mm stainless steel case, 18K white gold bezel set with 52 brilliant-cut diamonds, dark mother of pearl dial, diamond hour markers, and stainless steel Oyster bracelet. 36mm stainless steel case, 18K white gold bezel set with 52 brilliant-cut diamonds, mother of pearl dial, diamond hour markers, and stainless steel Oyster bracelet. 36mm stainless steel case, 18K white gold bezel set with 52 brilliant-cut diamonds, silver dial, diamond hour markers, and stainless steel Oyster bracelet. 36mm stainless steel case, 18K white gold bezel set with 52 brilliant-cut diamonds, silver dial, index hour markers, and stainless steel Oyster bracelet. 36mm stainless steel case, 18K white gold bezel set with 52 brilliant-cut diamonds, silver Jubilee dial, diamond hour markers, and stainless steel Oyster bracelet. 36mm stainless steel case, 18K white gold bezel set with 52 brilliant-cut diamonds, silver dial, Roman numerals, and stainless steel Oyster bracelet. 36mm stainless steel case, 18K white gold bezel set with 52 brilliant-cut diamonds, white dial, index hour markers, and stainless steel Oyster bracelet. 36mm stainless steel case, 18K white gold bezel set with 52 brilliant-cut diamonds, white dial, Roman numerals, and stainless steel Oyster bracelet.